The focus for the last two weeks has been on eating. 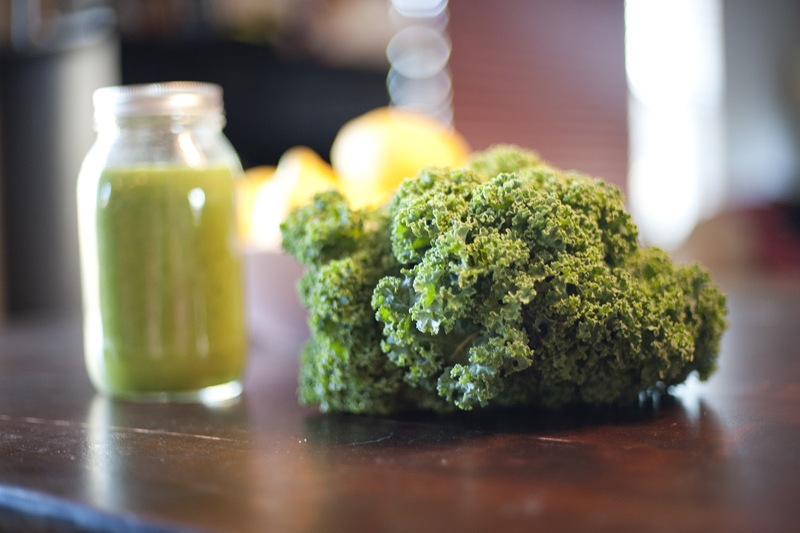 Nick & I followed the Conscious Cleanse - a program originating out of Boulder, but available to everyone online. The ladies who run the program are super nice & committed to teaching people their healthier way of cooking. They run the online group cleanse about 4 times a year, but also have a book if you want to do it on your own. The program involves eliminating the foods that commonly cause allergies/intolerances in people (caffeine, corn, gluten, dairy, alcohol, etc.) 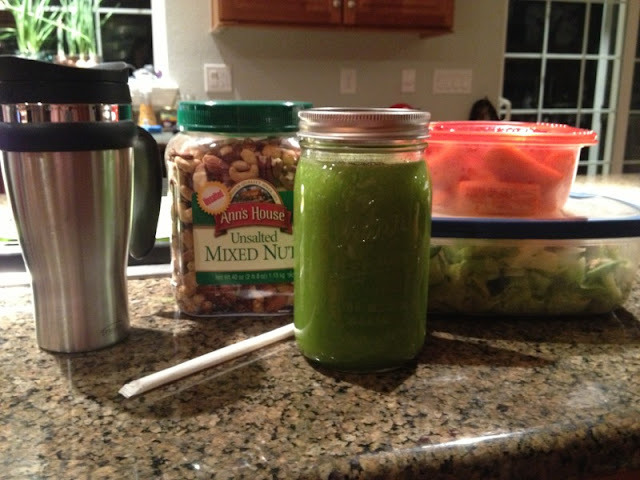 This is what Nick took to work on the first day (lemon water in the thermos). The mixed nuts aren't on the program, but he was really worried about being hungry. His salad had chicken & the apples have almond butter. I think he had one other snack too - maybe carrots. It was interesting to see how different people reacted to the program. Some had caffeine headaches. Some didn't start to detox until the second week. 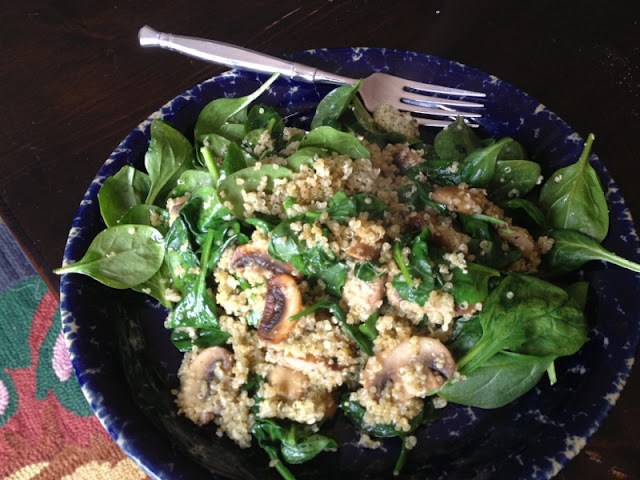 This is a typical lunch - basil pesto quinoa with mushrooms over wilted spinach. The Good: We tried some new foods & new smoothies. We ate a TON of produce. We even discovered that Swiss Chard tastes great in smoothies. I did this cleanse the two weeks before Thanksgiving. It was easier to stay on track this time, I didn't feel as hungry and with no travel/holidays on the horizon, I'm hoping we can keep this going a bit longer. Nick & I both feel better and are focused on keeping some of our changes permanently (though he did eat steak last night). My skin feels & looks better. The cleanse girls say that you can look 10 years younger after two weeks because this diet removes so much inflammation (i.e., puffiness). I am sure the only reason I haven't been carded is that I haven't tried to purchase any alcohol. The Bad: It took a lot of time to prepare food for 4 people every day - at least two hours a day in the kitchen. The kids ate their normal breakfast/lunch but ate our dinner. It was also expensive to buy this much produce. I had to make a mid-week run to Costco because we ran out of food. 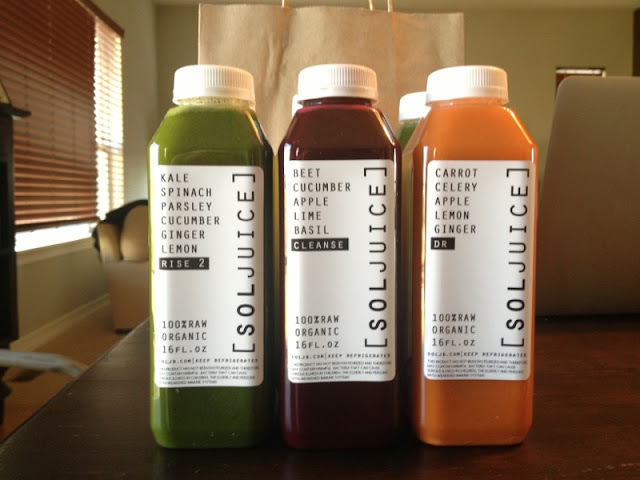 The Ugly: I finished the cleanse with a juice cleanse yesterday and STILL didn't lose any weight this week. Granted, this cleanse is not about weight loss - it is about learning to recognize how what you eat affects your body & emotions. But, you still expect to see the scale shift when you are eating so many veggies and no processed foods! Nick is holding steady at about 10 pounds (though he adds a lot more fat to his diet than I do) and I'm down about 6-7 pounds over three weeks. I suppose my numbers are consistent with what is recommended for long term weight loss, but I keep hoping for a "biggest loser" type weight loss week. I am so impressed with you two! How nice to do it together. But 2 hours in the kitchen? yikes!